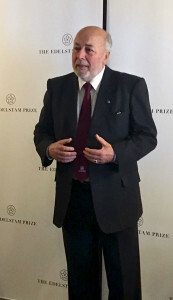 The Edelstam Prize 2016 is awarded to Judge Juan Guzmán Tapia of Santiago for outstanding contributions and exceptional courage in standing up for one’s beliefs in the Defence of Human Rights, and the prize will be awarded during a ceremony at the House of Nobility in Stockholm, Sweden, on November 15th 2016. Judge Juan Guzmán Tapia from Chile was a conservative magistrate in the Chile of the seventies. In 1973, after Pinochet´s coup d´etat he even become a sympathizer of the dictator because, as many Chileans, considered that the country needed “some order” and silently supported the military government. However, in 1998 Guzman´s thoughts evolved differently: he was one of the Judges at the High Court in Santiago de Chile and unexpectedly was appointed to investigate the former dictator Augusto Pinochet for the crimes committed during the military dictatorship lasting from 1973 to 1990. In his role as an investigating judge, the evidence began to arrive to his office. Guzman met the survivors, realized the magnitude of the systematic brutality the military had undertaken during the dictatorship, unknown for him until then, and the once conservative judge became personally transformed: “the victims opened the eyes of my soul”, he would say later. In order to narrow all the cases down, he concentrated on the month following the coup of September 11, 1973, and the crimes committed in relation to the “Caravan of Death,” a Chilean Army death squad who went all along the country executing political detainees. Guzmán then indicted the former dictator on counts of kidnapping and assassination. He performed investigations throughout the country in order to find the remains of ca. 1200 political prisoners who were still missing. Further, he established that the kidnapping of people who subsequently disappeared had to be considered a permanent offense to be prosecuted in spite of amnesties or statutes of limitation until the whereabouts of the missing person was determined. Then Guzmán indicted a great number of members of the armed forces. Through his work he managed to open up a new path of justice and inspire other judges to take responsibility on similar cases in Chile and in other countries. “It is important to find ways to enforce national and international law and promoting accountability for serious abuses against human rights and the responsibility of states where violations have occurred, and the responsibility of the international community as well, in order to establish justice, ensure protection of victims, and avoid impunity. Pinochet´s indictment coming simultaneously from Spain, France, Belgium, Switzerland and Italy is until today the best example of international cooperation for justice, a wonderful precedent of countries fulfilling their duties, their responsibility to protect. 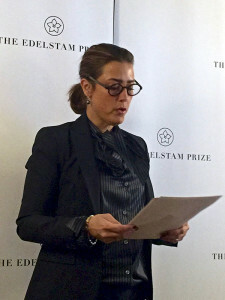 International law must become able to deter regimes from committing egregious crimes against their own peoples so history does not repeat itself” says Caroline Edelstam, Chair of the Edelstam Prize Jury and co-founder of the Edelstam Foundation. The Edelstam Prize Jury’s motivation to give Judge Juan Guzmán Tapia of Santiago the Edelstam Prize is: Judge Juan Guzmán was the first judge appointed in Chile to decide about the criminal complaints filed against the former dictator Augusto Pinochet Ugarte. It seemed unlikely in advance that Guzmán, a conservative judge, would take the task very seriously, but these expectations proved soon to be wrong. Increasingly moved by his interviews with victims and the overwhelming evidence against General Pinochet he discovered, the judge went through a personal process of understanding until he finally persuaded the Chilean Supreme Court to waive Pinochet’s immunity. Then, Guzmán indicted the former dictator on counts of kidnapping and assassination. He performed investigations throughout the country in order to find the remains of ca. 1200 political prisoners who were still missing. Further, he established that the kidnapping of people who subsequently disappeared was a permanent crime to be prosecuted in spite of amnesties or statutes of limitation until the whereabouts of the missing person was determined. Guzmán indicted and convicted a great number of members of the armed forces. He showed great civic courage pursuing his investigations. In spite of threats against him, judge Guzmán opened an important path for justice in Chile, which many other judges followed until today. The Edelstam Foundation recognizes the need of international legislation promoting accountability for serious abuses against human rights, and the responsibility of states where violations have occurred, and the international community as well, in order to establish justice, ensure protection to victims, and avoid impunity. History should not repeat itself. The international jury is chaired by Caroline Edelstam, Harald Edelstam’s granddaughter and co-founder of the Edelstam Foundation. Other members of the Jury are Judge Shirin Ebadi, Nobel Peace Prize Winner in 2003, Dr. Pascoal Mocumbi, former Prime Minister of Mozambique (1994-2004), Professor Philip Alston, UN’s Special Rapporteur on extreme poverty and human rights, Dr. Luis Moreno Ocampo, former Chief Prosecutor of the International Criminal Court (ICC), and former Judge Baltasar Garzón, who served on Spain’s Criminal Chamber of the National Court, who is consistently fighting for Human Rights. Baltasar Garzón is most famous for indicting the Chilean dictator, General Augusto Pinochet for the deaths and torture of thousands of victims from Chile and other countries.